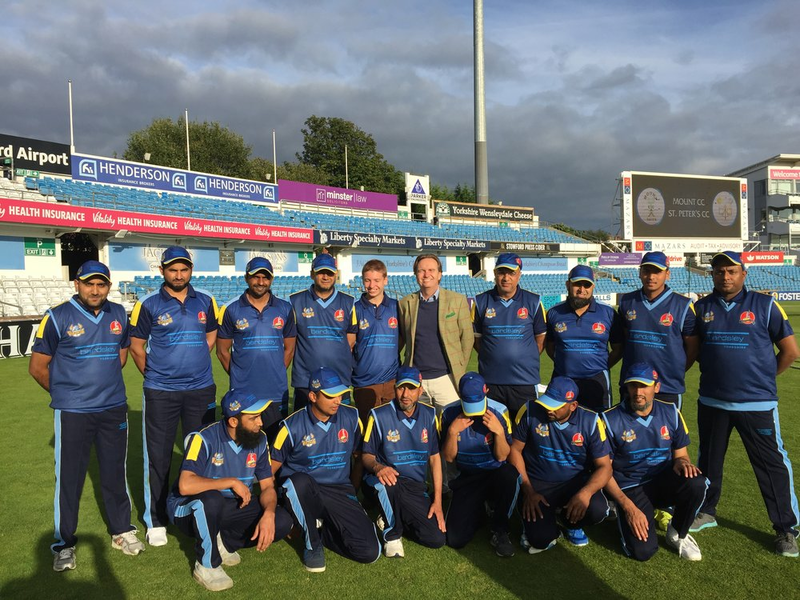 Mount Cricket Club, a team of Muslim players from Batley, West Yorkshire, is participating in a pioneering inter-faith tour with the Archbishop of Canterbury’s X1 and St. Peter’s XI of the Pontifical Council for Culture, Vatican. The teams representing the Muslim, Anglican and Roman Catholic faiths play each other in a three-way T20 Tournament on Thursday, 15th September 2016 at Edgbaston, Birmingham, the home of Warwickshire County Cricket Club, before a floodlit evening rematch between Mount and the Vatican side at Yorkshire County Cricket Club ground Headingley, Leeds, on Monday, 19th September. These matches follow a history-making fixture between the Mount and St. Peter’s sides in the autumn of 2015 in Rome when the Vatican side won by four runs on the last ball. Now the St. Peter’s XI are following up with another opportunity to strengthen interfaith relations, an event especially poignant as Mount CC is in the constituency of the late Batley MP Jo Cox, who was a supporter and friend of the Club. The touring Vatican side consists of Catholic priests and seminaries studying and working in Rome and that belong to St. Peter’s Cricket Club, an initiative of John McCarthy, former Australian Ambassador to the Holy See. The Anglican team was recruited through the Church Times with the Archbishop of Canterbury being Patron. The matches are designed to achieve ambitions including a celebration of faiths and beliefs, that a love of cricket can unite and empower people regardless of nationality and faith, and for the teams to be ambassadors for their respective religions; also to correct misunderstandings and to extend to the wider community the generosity of spirit experienced by the Clubs on and off the field. Founded in 1976, Mount CC has been creating cricket opportunities for 40 years at junior and senior levels. It is the first Asian team to establish genuine opportunities for South Asian girls and for children with disabilities, particularly Downs Syndrome. The Club is engaged with wider community activities and their work in forging links with other faiths is truly ground-breaking. 2016 has been a momentous year for Mount CC, having secured three trophies already this season the 1st Team is well placed to win the Premiership Title in the Huddersfield Central Cricket League. Other honours off the pitch include a Duke of York’s Community Initiative Award and one of Yorkshire Cricket Board’s Outstanding Service to Cricket Awards (OSCAs). Mount CC has also been shortlisted for the Team of the Year by the British Asian Cricket Awards, the ceremony for which is on 23rd September at the Kia Oval. The tour by Mount CC is supported by the Leeds-based Yorkshire division of Bardsley Construction, the family-owned construction business headquartered in Tameside, Greater Manchester. The support is especially welcome given Mount CC’s modest annual income largely generated from players’ membership fees and donations from the local community and supportive businesses. Due to the Club’s strict religious and ethical stance it continues to be frozen out from funding routes like the National Lottery funding as the Islamic rules forbid accepting money from the source of gambling. “We are delighted to have the support of Roly Bardsley in the forthcoming celebrations of embracing the spirit of cricket and friendship as part of the Vatican’s ‘Light of Faith Tour’. We are also excited to work with Bardsley Construction in a longer term ‘community partnership’ and its expertise will be invaluable in assisting the Club to improve our facilities for future generations”.